A Canadian city has banned an aquarium from bringing in new dolphins, whales and narwhals. The Vancouver Park Board voted to ban bringing in all new cetaceans, even if they are injured or rescued. Some people believe keeping large mammals in captivity is cruel and dangerous for the animals' health. But the Vancouver Aquarium says the ban effectively ends whale rehabilitation and research in Canada. The aquarium, which sits on land controlled by the parks department, currently has three cetaceans, all of which were rescued and considered incapable of living in the wild. These animals will remain and are not affected by the ban. Protesters on both sides of the debate turned up for the vote on Monday night. Public sentiment has been turning away from keeping whales in captivity for some time, says Vancouver Humane Society spokesperson Peter Fricker. "There's substantial scientific evidence that cetaceans do suffer in captivity, and that outweighs the benefit of putting them on display for our entertainment," he told the BBC. The Society for the Prevention of Cruelty to Animals also supports the ban. 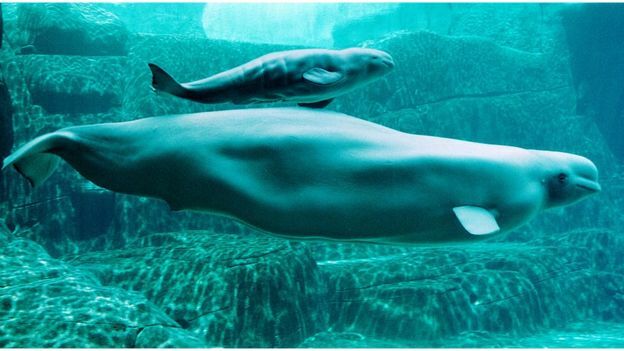 Michael Wiebe, chair of the Vancouver Park Board, said that after two belugas died within days of one another at the aquarium last fall, the board decided they needed to look into whether it was right to keep bringing in more. "I believe it is time to move on," he said. An internal investigation later found the whales were killed by an unknown toxin, possibly introduced through their food. But the Vancouver Aquarium says the ban will ultimately hurt the animals more than help. Its Marine Mammal Rescue Program is the only programme in Canada able to provide long-term care for rescued cetaceans that can't be released back into the wild, said CEO John Nightingale. "It turns its back on some of the marine animals in need when they are in need," he told the BBC. Although only six cetaceans have been treated at the rescue centre over the past 50 years. Mr Nightingale said its long-term care facility has helped attract top experts, who in turn have helped further research.